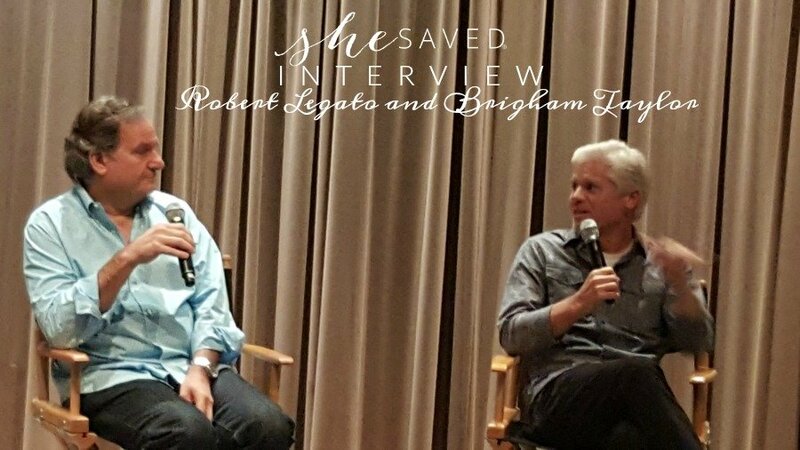 While I was in LA a few weeks ago, I actually had the chance to sit down and chat with the Jungle Book Visual Effect Supervisor Rob Legato and Producer Brigham Taylor. This discussion was so fascinating because it not only is the original Jungle Book such a classic Disney film, but the way that they handled this film’s transition to a live-action movie was so carefully and brilliantly done. I love their passion for their work, and even more, their dedication and commitment to bringing these cherished Disney stories to life in ways that Walt Disney himself probably never dreamed possible. And even if he did dream it, he would be so very proud of it. Legato: For me, doing this for a long time, having worked on these various films, what I always wanted to be able to do is to say okay, now that we have all this ability to do anything we want to do, let’s do something very specific in the tradition of why I was interested in the movie making in the first place. I think in everyone’s mind, you have a backlog of every movie starting from “Casablanca” on that impressed you in some way or saw a thing, a sensation and all that stuff, and so you want to make a movie that uses all this technology that doesn’t remind you of CG oriented movies, or superhero movies. It reminds you of films that you loved when you were growing up and so you almost do so much technology to make it disappear into the background and what I would like for the audience to respond to and then the future audience to respond to is that this is starting to make a demarcation where the digital portion is no longer a dirty word, CGO, they did it and CG is a dirty word. It’s the same artifice of moviemaking from the beginning. There were fake walls. There were fake sets, people wearing costumes, people wearing makeup. They are not saying their own words. They are saying words that are written for them but we divorced ourselves from all that when we get into the movie and so CG should be the same thing and so what I’d like for people to remember is that that’s what really occurred. That is the first time you forgot you were watching something that could have been done on a computer and it continually reminds you of live action shots you’ve seen, so you must be watching a live action movie. For me, we were making a live action movie. We were not making an animated film, we didn’t want it to look like an animated film like that. I guess the first time I think I got a big thrill from it was Idris Elba playing that character and the melding of his voice, his performance, the character he was playing, the way it was animated, that represented his emotion and then the way it was photographed and the sole total of the composite of that went wow, that’s a real character. That’s not a guy voicing a cartoon. That’s a real specific thing. And everybody else is great but for some reason he just like clicked in one notch. Taylor: My favorite part was the opportunity to sit in a room early on with a storyteller like John and our writer Justin, just to be involved in the conversation about what the film was going to be. We knew what the material was, but there were still a lot of decisions that were very unique to this movie, so to be involved in that early on is really exhilarating when it’s all sort of blue sky. And, secondarily to that I would say that by the time it was done, to be able to sit and watch the film get the desired reaction, a lot of films you work on don’t unfortunately, but this one did. You don’t know that until you sit in that audience and for me it was sitting with my kids and, and having them respond to it and both having the glee of experiencing these characters that they are really engaged with, which is always the hope, but also the wonderment of not being sure how it even happened, and so that was really exhilarating. If you haven’t yet seen this film (I hope you have, it’s amazing!) you will see that there are some pretty intense moments. Here, Taylor and Legato talk about the hardest to film scenes, one of which was the scene in which young Mowgli says goodbye to his wolf mother. Taylor: Saying goodbye to the mother because of the interactivity and also because of the level of performance, again, we had Neel in his first film, having done no acting prior, and it was a heavy emotional scene. It was also one of the most demanding technical scenes. I feel like we could talk about that scene for a year, both in terms of how we were going to accomplish it. But then also to have performers from the day and there were shots of Sara Arrington, another one of our off-screen sort of performers who was really key to just being there in the moment for Neel and giving the emotion of the mother in that moment and then I also look at the stampede in terms of you saw that little muddy trench that we built, which was all we had for that scene you know? Neel didn’t particularly love that, he’ll be the first to admit he didn’t love being muddy. So it was a challenge for him physically but then also just us running all those stuntmen up and back, up and back, the technical lighting we had to generate there, sending our cameraman, Bill was in there, just mud up to his gills for days. That was kind of a challenge. Legato: For me it’s a slightly different challenge, because I’m sort of used to doing all that stuff, so I was not as daunted by it because I’ve done things and I knew the technology was at a certain point and we had really spectacular people, so I was not as nervous about the mechanical stuff. There’s the peace rock scene where there’s so many animals and so many different things that had to look and feel like the way it feels in the movie. You’re starting with a blank page.What am I seeing? What are we going to put there eventually to justify why we were looking over here? And all those things. I’m a visual person and I needed to have something that determines other things. If there are a lot more animals in the scene and the shot is slightly wider, I’m doing a camera move. We have to invent it all as we are shooting it and to me those are the harder scenes to do. 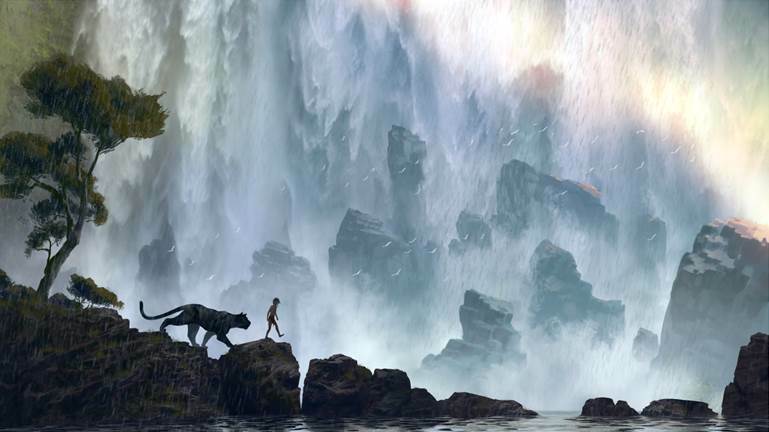 Taylor: The scene where Mowgli is first seeing all the animals, the watering hole was mostly done in one take. Although we wound up cutting it up, but we probably ran more versions of that over the course of two years than any other. Taylor: The cool thing is there isn’t anything that we wanted to do that we couldn’t do technically. It turns out that the only restrictions were self-imposed. We didn’t want the film to be too long. We were trying to be very strict about the duration, in terms of the overall experience, but there was nothing to my recollection that we set out to do that we didn’t accomplish and that was really neat. Taylor: All the animation that came out of the book. Legato: Well again, the concept of it, because it’s all loose until it all kind of comes together and then when it comes together we are releasing the movie. Taylor: For me, just as a movie fan, I like hearing about little inspirations and tidbits that you wouldn’t have necessarily understood. It’s sprinkled throughout the pieces, like when Jon mentions how we were looking at the piece for Bambi, in terms of the inspiration for the first movie. I find it interesting. I find it all engrossing. I like having digested in 30 minutes what took 2-2-1/2 years and looking at it that way, but I love hearing about the sort of behind the scenes creation inspirations in terms of why stuff wound up on the screen the way it did. Legato: And I think for me, I need something in the back of my head to produce something. It is the idea of the homage to Disney. The very opening piece, there is a very slick animated CGI opening to all Disney movies now and they take advantage of everything, and there is something very charming about the brilliant idea that they had with the multiplane camera and all that, so how do we subtly create a homage that makes you feel comfortable, like you’re watching an old Disney film. And then we magically transfer you from that into our modern technology of being able to play it without hitting you over the head with it. We found a Disney animator to do all the fireworks and all the stuff, and I had my son shoot it in the technicolor way, just the way they did it back in the day and we recreated it on the computer with the multiplane camera which was actually in one of the buildings here, the science and industry of it, the idea of it, that’s the kind of the paramount thing is the creative idea. And the,n in the process of doing it, even as a filmmaker you’re subtly reminded that you didn’t really come up with anything original. When you look at Snow White and you start doing research, motion capture is roam scoping. It’s just an automatic way, roam scoping. Well, they did that back then to give Snow White the feeling of her dress moving and her moving around and everybody was how do they get such life like quality to it? It was top secret at the time. They filmed it and then the animators used that as a reference. And it’s no different than what we do. We have different tools. We have more modern equipment. We can see it instantly. They would have to wait a day to do it. So, there’s something about standing on the shoulders of Walt Disney and his group of people who were trying to push the envelope creatively to give a more emotional experience to the audience and so the fact that we sprinkled that in. It wasn’t just oh, that would be cool, because that’s not good enough. That would be cool, because that kind of diminishes over time, just like it’s a flavor of the month and you forget about it. But it’s something that resonates. It’s something that lives for a long time and you kind of have some deep-rooted psychology to it. That to me was fascinating. I love the history of movies. I love all that. It’s the reason why I got into it in the first place. If you love Disney, then you will LOVE the bonus content on this DVD. It’s like several additional movies in itself and includes an indepth look at the work of the men that I mentioned above along with director Jon Favreau (brilliant!) and voice actors Neel Sethi, Bill Murray, Ben Kingsley, Idris Elba, Lupita Nyong’o. 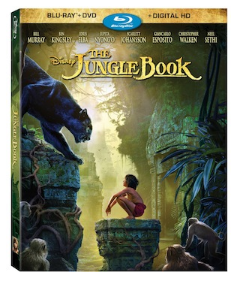 You can preorder Disney’s The Jungle Book on Blu-ray or DVD now and get it when it releases on August 30th plus when you order on Amazon, you get their lowest price guarantee. 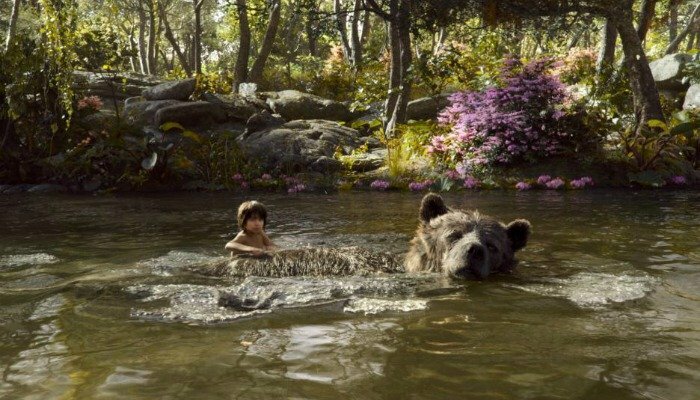 Disney’s The Jungle Book comes to Digital HD onAugust 23 and on Blu-ray August 30th! And…make sure to mark your calendars!! Disney’s The Jungle Book comes to Digital HD onAugust 23 and on Blu-ray August 30!